As you can see, everything is precisely explained in the chart. 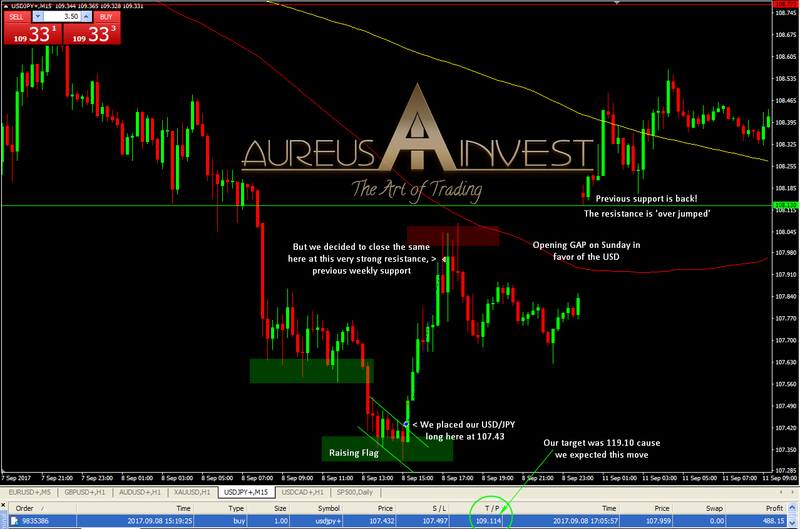 The pair was supported for several times from 108.13 (the low), all the way to 108.70 and on Friday September 08, the pair finaly broke the support, closing the week at 107.84, well bellow the support area. For sure, that closing on Friday gave the sellers view of the possible furder fall toward 106 and they’ve probably placed SL-es above the previous strong support. On Sunday evening, without any particular reason, (yeah, yeah I know N.Korea didn’t fire a missle during the weekend) the pair opened above the support level at 108.13. That level gave the buyers strenght again and they have continued to push the pair strongly up during the Monday, all the way to 109.40. In my point of view, exactly where the short stops were placed. Well, there is only one reason for this move and that’s a so called stop loss hunting. Nobody can say othewise because, this was techically clear short trade for this week, as most the analysts have predicted during the weekend. I predicted the move simply based on psichology of the market and try to trade the same. How? 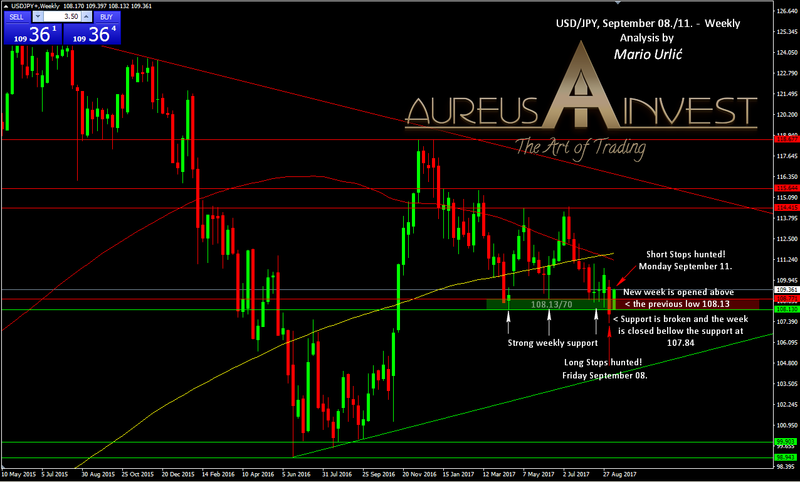 Take a look at our USD/JPY long from Friday. I sow that move could come, but I even thought that, they will make it on Friday evening. That’s why I searched a place for long and found the same here almost at the bottom. I waited for the buyers to confirm the support and to broke the trend line (Rasing Flag), after which I placed our long at 107.43. I’ve placed our target at 109.11, yes 109.11! Why? As I wrote it already, I sow it coming and I was sure it will happen. But, because of the strong resistance at the area of the previous strong support near 108.00, I’ve decided to close our long on Friday. Why? I usualy trade what I see, not what I think and I didn’t want to leave the position opened during the weekend, despite my prediction of the possible move on Friday. I simply didn’t want to gamble with real account. Well, the opening and today’s move proves I was right and the move up, let’s say the SL hunting happened indeed. Always think of this and be careful on importnant levels. The analysts called this a fail brake, but that’s not a fail brake. That’s a move with a purpose, how the banks will took your money in the market. You simply should not take their money, right!? Try to see something like this before it happens, before everyone. If you don’t, the big market players will take your money as well. I don’t see this move as a regular and ususal daily SL hunting, but more as an opportunity for the big ones to take a bigger money on huge volume.